CEDARVILLE — Mike Wilkerson, children’s pastor at Spring Creek Church in Pewaukee, Wisc., will speak in chapel at Cedarville University Thursday, Feb. 7. 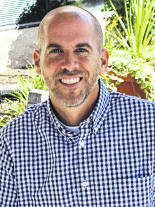 Wilkerson is a graduate of Cedarville University, class of 1994, and has a bachelor of science in Bible comprehension. He continued his education at Grand Rapids Theological Seminary in Michigan, earning a Master of Arts in ministry. Wilkerson began church ministry directly out of college as the pastoral associate at First Baptist Church in Carmel, Ind. In this role, Wilkerson was the student ministry director, worship leader and outreach coordinator. After his time at First Baptist, Wilkerson served at Calvary Church in Fruitport, Mich., initially as the spiritual life coordinator for Calvary Christian Schools. Over time, Wilkerson transitioned to being the pastor of young families and sports outreach, until 2009 when he became the children’s pastor at Spring Creek Church. Chapel begins 10 a.m. and is open to the public.